Although I don't have twins of my own ... it seems that I am surrounded by twins - to the point that I was very nervous for my U/S this pregnancy to make sure it WAS only 1 in there and although I would love to have another one in the future - doubly scared that the third pregnancy would be twins. I have so much respect for all the twin mom's out there and especially for moms of larger sets of multiples. Kudos to you, because I don't know that I could handle it. 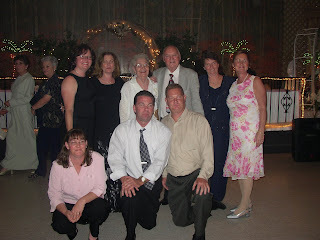 My mom (1 of 7 children) has a set of twin siblings - My Aunt Renee and Uncle Mike. My sister, Lori, has been pregnant with twins twice - girls that she sadly lost around 14 weeks gestation and her 4-year-old boys Adam and Ethan. Russ and Debi (Chris's brother) have almost 2-year-old Emma and Will. My sister's SIL (her husband Jeff's sister) just delivered Seamus and Sophie last week at only 28 weeks gestation (they are doing well, but please send prayers their way). There is also one more set of twins surrounding us - literally. Directly behind our house, live Rachel and Olivia. They were born in March 2005 -and are just 3 1/2 months older than Katie. Rachel was diagnosed with Rett Syndrome last year. Rett syndrome is a unique developmental disorder that is first recognized in infancy and seen almost always in girls, but can be rarely seen in boys. It has been most often misdiagnosed as autism, cerebral palsy, or non-specific developmental delay and is caused by mutations on the X chromosome on a gene called MECP2. There are more than 200 different mutations found on the MECP2 gene. Most of these mutations are found in eight different “hot spots.” Rett syndrome strikes all racial and ethnic groups, and occurs worldwide in 1 of every 10,000 to 23,000 female births. Rett syndrome symptoms appear after an early period of apparently normal or near normal development until six to eighteen months of life, when there is a slowing down or stagnation of skills. A period of regression then follows when she loses communication skills and purposeful use of her hands. Soon, stereotyped hand movements such as handwashing, gait disturbances, and slowing of the normal rate of head growth become apparent. Other problems may include seizures and disorganized breathing patterns while she is awake. In the early years, there may be a period of isolation or withdrawal when she is irritable and cries inconsolably. Over time, motor problems may increase, but in general, irritability lessens and eye contact and communication improve. A landmark study reversing the symptoms of Rett syndrome in a mouse model was announced on February 8, 2007, based on an experiment performed by Dr. Adrian Bird, Ph.D., and past chairman of our Scientific Advisory Board. The results were astounding; breathing and weight were normalized, mobility and gait restored, and tremors disappeared in mice just days away from death. The principle of reversibility was established; the study suggests Rett syndrome and related disorders may be reversible even in the late stages of the disease! To help support research to find a cure for Rett Syndrome, Rachel and her twin Olivia along with their parents Kris and Steve will be participating in the Stroll and Roll for Rett Strollathon this weekend in South Yarmouth, MA. If you would like to help, you can make a donation by visiting http://www.rettsyndrome.org/, click on "Make a Donation" in yellow at the right. Scroll all the way to the bottom until you see the strollathon logo and click. You are able to select the Cape Code location and make your donation in honor of Rachel Medeiros. thanks for the rett syndrome shout out! I am the mom of Avery, 2, who has rett syndrome. I wish more people would help get the word out about Rett syndrome. They think that the research that is being done with RS will unlock a ton of other things, a Rosetta stone of sorts.